All former servicemen of the Ukrainian special Berkut police unit who chose to accept Russia’s offer of citizenship will get jobs and social support in Moscow, Interior Minister Vladimir Kolokoltsev has said. “They must meet all recruitment requirements of the Russian Interior Ministry and they will go through all the procedures our agents go through. But I am sure that our Ukrainian colleagues will not have any problems and their professional quality will be in demand,” the official said in an interview with the business daily Kommersant. Kolokoltsev also promised a “special attitude” for the family members of the former Ukrainian policemen. “In fact, both Berkut troops and their families were caught in an emergency situation and each family will receive aid at their new place – both in housing and in education for their children,” the minister said. According to the Russian police chief, ex-Berkut servicemen will be free to choose the place and region of their future service if it fits the plans of the Russian Interior Ministry. “Considering the specifics of their work we will offer them to serve in units where their experience and professionalism are in greatest demand,” Kolokoltsev noted. The minister added that he was very impressed by the discipline and patience demonstrated by Berkut during the Kiev crisis in late 2013 and early 2014. At the same time the Russian official said that it was not up to him to assess the actions of law enforcers from another country. In late February Russian MPs suggested a simplified procedure for granting citizenship to Ukrainian citizens who could face repression at home for opposing the Maidan movement which pushed for government change in Kiev. The authors of the bill also suggested Russian law enforcers consider giving jobs to former members of the Berkut police unit. “If any of them find it attractive to work in Russia we should give him a place in our police and other law enforcement structures in accordance with his rank and qualifications,” Sergey Mironov of the Fair Russia party has stated. Berkut special police controlled the Maidan rallies in their peaceful phase. When protesters started burning tires in the city center and attack police with Molotov cocktails, stones and clubs, the Berkut officers obeyed the order not to use weapons and held their positions despite suffering casualties. 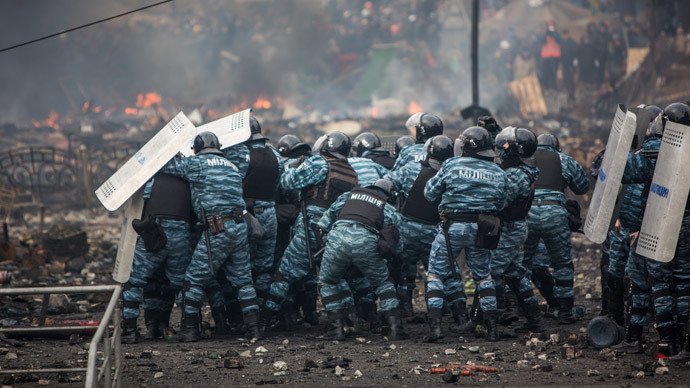 At least 17 policemen were killed and hundreds were wounded in the standoff.Berkut left their posts only after President Yanukovich stepped down and fled the country. On March 1 nine Berkut officers from Crimea received Russian passports in the consular office in Simferopol.